Use topically for first, second, and third degree burns with blistering, redness and pain. Also for sunburn, eczema, psoriasis, external hemorrhoids and festering sores including bedsores and boils. Useful in pediatric eczema. This is one of China’s major herbal medicines for burns, so much so that it is used for serious third degree burns in hospitals. As a product, it is recommended as a topical first aid for first and second degree burns. It reduces the blistering and pain of a burn, promotes tissue regeneration, and prevents scarring. Burns should be covered to protect the ointment form being wiped off. For serious burns, the ointment is put on, covered with gauze, and then wiped off with dead skin every 24 hours until healing is complete. Stops pain, decrease inflammation, detoxification, promote regeneration of damaged tissues due to burns. For first or second degree burns, first clean the area, then rub the ointment directly on the surface area of the burn. Cover the area with gauze. Apply the ointment and change the gauze daily. For third degree burns without infection, treat the same as first or second degree burns. For third degree burns with infection, the wound should be cleaned every day and larger amounts of the ointment should be used. Keep the wound covered. For hemorrhoids or bedsores, apply the ointment locally. 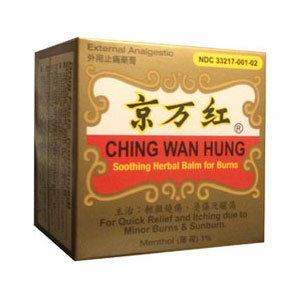 After applying this ointment, the pain is usually stopped immediately. For external use only. Avoid contact with the eyes. This product can stain and discolor clothing. Remove with alcohol. Also, it has a strong smell. Do not apply topically to lower abdomen or lumbar spine during pregnancy. Stop use and ask a doctor if condition worsens, symptoms persists for more than 7 days, symptoms clear up and occur again within a few days, if nausea, vomiting, abdominal discomfort, diarrhea, or skin rash occurs. Keep out of reach of children. If swallowed, get medical help or contact a Poison Control Center right away. Children under 2 years of age do not use, consult a doctor.